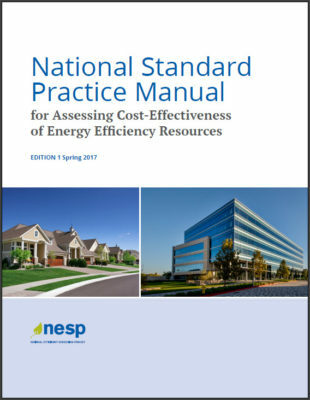 It’s been over a year since NESP published the groundbreaking National Standard Practice Manual (NSPM). After months of ongoing state outreach to build understanding of the NSPM, stakeholder interest is intensifying. Some jurisdictions are “dipping their toes in,” while others are venturing from shallow to deeper waters. New developments in NSPM awareness and application show states taking the NSPM from theory to practice around the country. Has the NSPM been referenced in your state? Regulators, practioners, utilities and others are talking about the NSPM – perhaps not at the beach (yawn) – but in open dockets and public comments, reports, and in webinars and in-person conference presentations. To date, the NSPM has been referenced in 15 states and several prominent reports, such as AR, CA, CT, ID, IL, MI, NH, NV, WA among others. 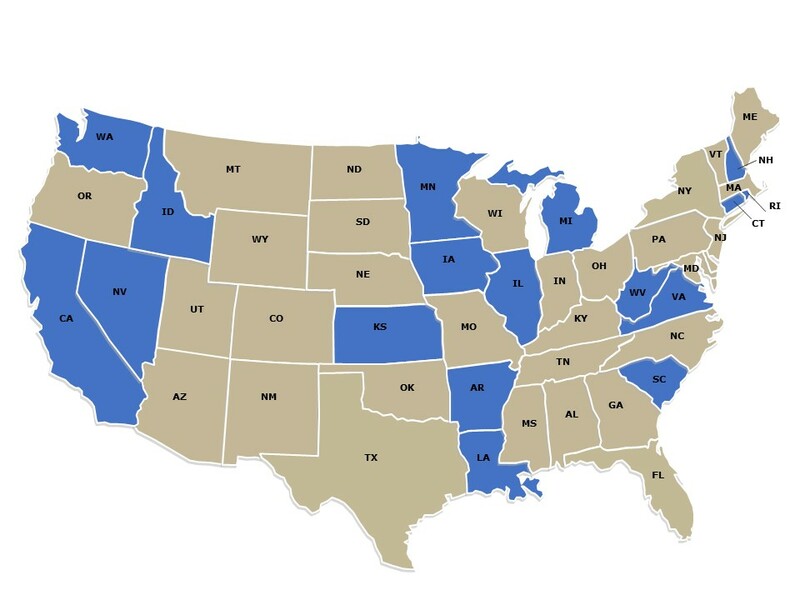 States where the NSPM has been referenced thus far are highlighted in blue. The Arkansas Public Services Commission (PSC) acknowledged in a late 2017 order that “the recent publication of the National Standard Practice Manual (NSPM), which suggests additions and refinements to traditional approaches to cost-benefit testing of EE programs.” The PSC directs the Parties Working Collaboratively, which includes contractors, utilities, and other stakeholders, to “consider the findings and recommendations of the NSPM as it resumes work on the next three-year cycle of planning and to address the carbon pricing issue in that context.” Below, I share more details on Arkansas’ deeper dive into applying the NSPM. In comments submitted in April to the California Public Utilities Commission on the Amended Proposal on the Societal Cost Test, the CEDMC said that California’s “Amended SCT Proposal aligns with most of the National Standard Practice Manual, and should strive for complete alignment with its common-sense principles.” They highlight areas in which the Amended SCT could achieve improved symmetry, while also recognizing California as a leader in cost-effectiveness testing for energy efficiency (Rulemaking 14-10-003). In Washington the WA Utilities Transportation Commission (UTC) staff comments on utility Biennial Conservation Plans, the UTC staff indicated that “Currently, the UTC uses a modified TRC test as the primary test to evaluate conservation programs. This test has been tweaked numerous times over the years, and Staff is unsure whether all policies are accounted for correctly, or whether companies are applying the test in a manner commensurate with one another. Staff believes that working through the framework outlined in the NSPM collaboratively with stakeholders would allow the Commission more certainty that the cost-effectiveness of energy efficiency is being properly evaluated.” The utilities (PSE, Avista, and Pacific Power) in turn have recommended a collaborative process to discuss cost-effectiveness calculation policy goals, implementation of any potential revisions, and applicability to other resources. This process is underway. In comments before the City Council of New Orleans, the Alliance of Affordable Energy has recommended that New Orleans consider the NSPM and RVT when developing their Technical Resource Manual and in evaluation of DSM resources. The range of NSPM references to date, including those above, may be useful for interested parties to use and/or refer to in other state discussions and proceedings. Meanwhile, if we’ve missed any state or jurisdiction that has made reference to the NSPM, please let us know (NSPM@nationalefficiencyscreening.org) as we aim to update state interest on an ongoing basis and identify potential needs for state technical support. Who’s Wading into Deeper Waters? 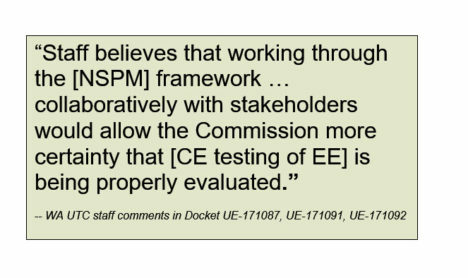 Beyond RI, a few jurisdictions are now venturing into deeper waters by systematically reviewing their current CE testing practices relative to the NSPM core principles, thereby “testing their test” to check on alignment with the principles. As noted earlier, the Arkansas PSC has taken interest in the NSPM. In its Order, the PSC identified a continued lack of consensus on cost-effectiveness testing throughout the US. This finding led the commission’s order directing the PWC to consider the NSPM during their next three-year planning cycle. A formal process is under way to apply the NSPM framework to Arkansas’ current practice, culminating into a case study and report to the commission on whether/how current practice aligns with the NSPM, and recommendations for any modifications in the state’s CE testing practices. You can learn more about the Arkansas case study steps and process from the Southeast Energy Efficiency Alliance (SEEA) recent article on NSPM case study. Like Arkansas, the state of Minnesota is also venturing well beyond its (Lake Superior) sandy shores, as it undergoes a Department of Commerce formal review of CE testing practices relative to the NSPM. Conducted by Synapse Energy Economics, the review, to be completed by September, will make specific recommendations for how Minnesota CE testing practices can be better align with the NSPM principles. A recent presentation by Synapse and the Department of Commerce staff at the National Association of State Utility Consumer Advocates (NASUCA) mid-year meeting presents an overview of the case study process, and addresses the most vexing challenges in designing a primary cost-effectiveness test for the state. And finally, the state of Washington is knee-deep into the NSPM. Having taken a full inventory of its relevant policies last fall, the UTC staff has now convened a stakeholder group to take a closer look at the range of costs and benefits included in the state’s current test, with an emphasis on reviewing utility system impacts, and alignment of non-utility system impacts with identified applicable policies. Separately, New Hampshire, North Carolina, and West Virginia have recently taken an interest in learning about the NSPM and how it can be used to enhance their current cost-effectiveness testing. E4TheFuture, with its partners and allies, is providing information and technical support as interest and opportunities arise. See You at the Beach? Staying cool this summer of course entails a visit to Asilomar at ACEEE’s Summer Study. A paper on the NSPM will be presented (August 15) focusing on the active case studies under way. A planned informal session on the NSPM will include sharing exciting developments on forthcoming resources to help states access cost-benefit data and tools/methods (utility and non-utility system impacts); as well as a scoping effort under way to expand the NSPM to address other DERs. On the latter topic, you might be interested in hearing Tim Woolf of Synapse Energy Economics speak at the upcoming July NARUC Policy Summit. I hope to see you at these venues. And if you have not already, I encourage you to dip your toes into the water and take a closer look at the NSPM, or even a deeper dive . . .